» P.A.T.H. Finders » Articles & Literature » People & Places » Czech Research: Without Serendipity? No Way! Frustrated with my Czech ancestry research, in 2002 I went to Mesa, Arizona, to seek help at the regional meeting of CGSI (Czechoslovak Genealogical Society International). I was a little late in arriving at the banquet meeting and found all the tables full. Finally, I spotted a table way in the back that had two seats available. I sat down. Within minutes a young man came and sat down beside me. We introduced ourselves. He was Tom Zahn, an American married to a Czech girl, living in Prague where they ran a mom and pop business, P.A.T.H. Finders International: Personal Ancestral Tours and History, researching family history and taking clients to visit ancestral villages. Tom explained the difficulties Americans have researching Czech ancestors. In 1620 the aggressively Catholic Austrian Hapsburgs at the battle of White Mountain defeated the independent protestant Bohemian kingdom, forcing their new subjects to become Catholic. In order to keep track of their new subjects for tax purposes, in the 1640s the Hapsburgs instituted record keeping in every parish of each birth, marriage and death. Because the Czech Republic was not subjected to the total devastation of World Wars I and II, those records are still available, although now in regional repositories rather than the village parishes. Those repositories present problems of their own. Once the place of birth of the ancestor is known, the correct repository can be found. Then an appointment must be secured; when the day and time are assigned and you have presented yourself at the repository, you then have two hours in which to do your research. Which records are you seeking? Birth? Marriage? Death? For which time period? Perchance you find just the records needed, can you read Czech? Old Czech? German? Old German? Latin? Old Latin? Not I, said this Little Red Hen. $25 an hour seemed like an incredible bargain to pay Tom and Marie’s professional researchers to ferret out the mysteries of Czech genealogical research, needing only the village of my ancestor’s birth and approximate birth date. Ay, there’s the rub! I knew Grandfather’s birth village and date, as well as the town Grandmother’s mother Antonia Pecka came from, but Grandmother’s father, Joseph Dusil’s place of birth was a mystery, because everything he signed in this country stated Place of Birth: Bohemia. My first experience with serendipity had led to Pathfinders’ successful research of the Severa and Pecka lineages. Now I would need incredible good luck in the Dusil search. With redoubled efforts I poured over citizenship application and real estate records, marriage, death and burial records, and even wrote to Czech language newspapers and magazines of the period to see if there were obituaries of Joseph Dusil, hoping for a birthplace listed. Nothing. Finally, I obtained a Family Search film of passenger records from Hamburg. There, sailing for New York on 1 May, 1855 was the Elise Rübeke, Capt. R. Boysen at the helm; among the passengers was a group of 14 Bohemians from Vamberk, including Josef Dusil and Antonia Pecka. What was she doing in Vamberk? She was born in Rychnov. I excitedly e-mailed Tom and Marie, so their researchers could start working. Not long after, I went to Bend, OR, to visit my younger daughter. Every morning it is my practice to do 20 minutes of yoga and stretch exercises. In the little room where I was staying, there simply wasn’t enough floor space for the exercises. So I went down into the living room. When I had finished the routine, I went over to the bookcase to visit my old friends, for when we had broken up the big old family home in Cedar Rapids, I had divided the library between the two girls. There was a book I knew had belonged to my grandfather, and I took it out, thinking someday I really would like to read it, when I noticed a little book next to it. When I removed it I saw imprinted on the front cover the words My Trip Abroad. Hmmmm. I opened it and immediately knew it was my mother’s diary of her family’s trip abroad in 1907, when her father took the whole family to Europe for a year following her graduation from high school and her brother’s graduation from college. She had told me about the trip, and I wondered what she said about Grandfather’s village. I leafed through and read that part, then turned the page and the words leaped off the page: “…and then we went to Synkov where Grandfather was born” Omigod! There it is. I ran upstairs to JoAn’s office where she was working. “Can I use your computer?” “Yeah, sure.” I sent Marie an e-mail telling her what I had found…..did it make sense? The reply came: Yes, it makes a lot of sense. Synkov is a little village not far from Rychnov and also Vamberk. Serendipitously the Dusil genealogy was about to become untangled. 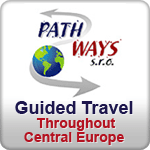 CGSI was planning their first-ever annual meeting/tour to the Czech Republic and Slovakia in September, 2005. JoAn and I were signed up for it, and we would stay over to have Pathfinders take us to see our ancestral villages. Fate had other plans for me. I was in a serious car accident in July, 2005. With three of my four limbs in casts, my dream trip was canceled. In the fall of 2006 serendipity arrived in the improbable form of the Elderhostel catalog. A 2-week walking tour was scheduled for June, 2007, in the Czech Republic. I immediately enrolled. In the winter I started conditioning myself with daily 5+mile walks. The tour itself was delightful: only 10 participants, charming hotels awaiting us, walking in beautiful areas of Moravia and Bohemia, visiting cultural and historical gems. I stayed over by myself in Prague’s Old Town for 6 days, pigging out on museums, plus 2 day trips out of town with Marie and Tom. JoAn arrived after her teaching stint in Germany, and for 5 days Marie took us to see our ancestral villages. Fields of white poppies, golden wheat and barley, enormous elderberry bushes laden with white blossoms, rolling hills – eastern Bohemia vividly reminded us of eastern Iowa. In two of our villages we were met and escorted by the mayors to see the homes (some of them are still standing even though our ancestors arrived in the U.S. some 150 years ago) and learn about the town’s history – one had records going back to 1008 A.D.
Back home, it took me 3 weeks to put together the 2 photo albums of the trip. I was still all fired up, so started to write and finish putting together the genealogy of my grandmother’s side of the family. How do I make a genealogy interesting and perhaps even entertaining enough to keep eyes from rolling? I had written about our family Black Sheep and her two Black Sheep husbands, and decided to continue in that vein, questioning which side of Grandmother’s family the Black Sheep gene came from. For 4 months I was anchored to the computer, writing and scanning. A quick trip to Cedar Rapids to celebrate a friend’s 80th birthday gave me the opportunity to do just a bit more research on the Dusil family, coming back with more tidbits to use. One morning when I came home from my daily workout at the Y, there was a DHL package on my doorstep. I had ordered nothing. Lisa usually sent things via DHL, but I had just talked to her on the phone a couple of nights before and she had not mentioned that she was sending me anything. Strange. The package was heavy. It was an old, old photo album. I opened it. The Dusil family album! I had known it existed, for Mother’s cousin Stella had told me about it. Stella died in 1980 and I had briefly wondered what happened to the photo album. Lisa had fallen heir to it when Mother died in 1990 and Lisa had to clean out Mother’s apartment. What treasures! Pictures of family members I had only read about. And there was our Black Sheep as a baby and little girl. One picture is worth 1000 words? 119 of them spared how many trees? Black Sheep and Other Peckas and Dusils became a reality, thanks to serendipity.